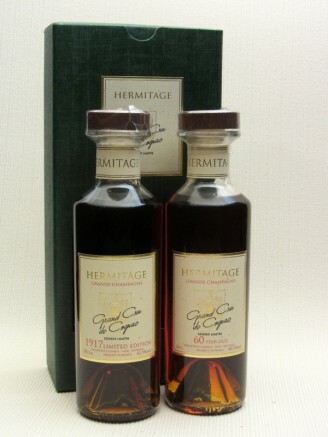 We make no pretence, Hermitage single estate cognacs are the very finest available in the world today. Years of research has identified distillers who are able to combine the specific viticulture, viniculture and complex ageing procedures required to produce exceptional cognacs of distinctive character. Our understanding and synergy with these highly individual producers has created pure cognacs of great maturity and finesse unlike more commercial cognacs that use additives to conceal their young ages and aggressive character. Our unique position enables us to concentrate on these very special nectars, many of which have laid in cellars for decades, rather than the more commercial and larger quantities required by the big houses such as Hennessy, Courvoisier, Martell et al. Cognac houses such as these will blend thousands of young brandies together to create the generic VS, VSOP and XO titles. 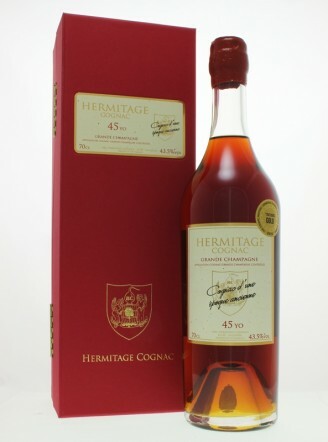 Hermitage Cognacs are the result of very specific distillation qualities and long, careful ageing in oak casks, from a single estate producer. Our commitment to locating exceptional cognacs has been recognized in the multiple awards received by Hermitage Cognacs. 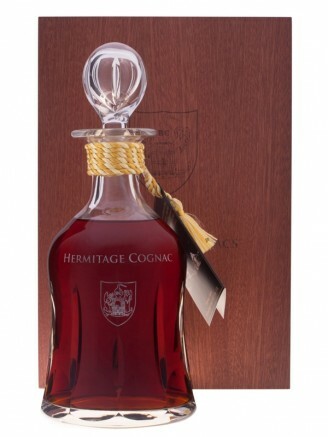 These prestigious cognacs can be found in some of the most famous bars and restaurants in the world, having carved an enviable reputation in the luxury cognac market for producing distinctive, rare and sought after vintages of exceptional individuality and quality. 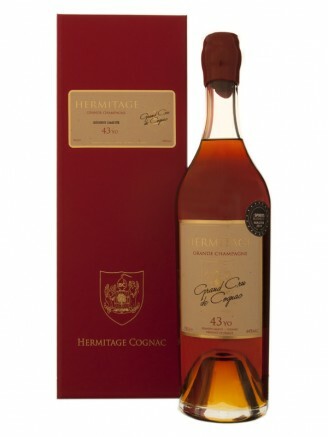 "Superb cognac from one of our favourite independent bottlers of brandy" Hedonism Wines, Mayfair. This Grande Champagne cognac is produced by a firm in the centre of cognac who produce from three vineyards in the very best parts of the cru. It is a particularly complex 25 y.o. that has benefited from expert ageing in Limousin oak barrels. A multitude of aromas and flavours which develop in the glass , but only if you can manage to keep it in there long enough. This Grande Champagne cognac is probably one of the finest cognacs we have ever tasted. 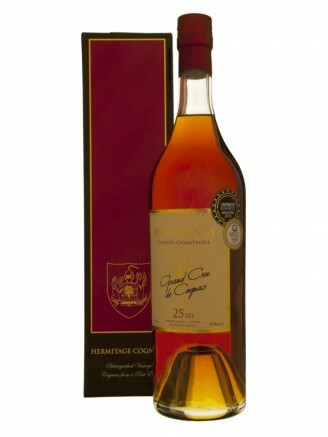 It is produced by a firm in the centre of cognac who produce from three vineyards in the very best parts of the cru. This is a cognac of great distinction and it requires time. It must not be hurried as the many aromas and flavours need to be discovered slowly. The initial aromas are of warm fruit cake and sultanas and they are matched on the palate. Hints of crab apple compliment these flavours and bring together the intense rancio with other flavours of orange syrup and porcini. The depth of rancio is worthy of an even older Grande Champagne cognac. Flavour: Fruit cake with a little bit of mangosteen tang, a hint of crab apple combines with orange syrup and a background of porcini. Much richness and intense rancio qualities. Hermitage 1917 Limited Edition Cognac was distilled more than 100 years ago and its partner has been aged in the barrel for 60 years. It is the long ageing process that gives cognacs depth of flavour, especially those from Grande Champagne, the premier cru. 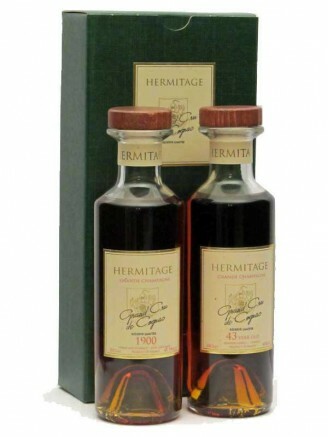 Two fantastic bottles of cognac history make the perfect gift for the cognac connoisseur. Many of the very finest and rarest cognacs are hardly ever tasted since the prices are often beyond the reach of many cognac devotees. So, to give more cognac fans the opportunity to enjoy these wonderful old nectars, we have created a completely new presentation which contains two special 20cl bottles of our really old, exceptional cognacs. Enough to enjoy amongst friends. This option combines the very fine Hermitage 1900 Salles d’ Angles with the wonderfully complex Hermitage 43 Year Old from Segonzac, both are Grande Champagne cognacs. This is an exceptional opportunity to taste these wonderful amber nectars, don’t miss out as only a few are available. This remarkable cognac comes from the top cru in Cognac known as Grande Champagne and has been aged in oak casks for more than 60 years. Aroma: There is a great complexity of autumnal aromas in this cognac including cigar box, tobacco and truffle as well as ginger, clove and dried fig. Flavour: Pure cognacs of great maturity are the finest expression of the distiller. The fine qualities of this cognac are a display of centuries of skill and understanding of distillation and cellar ageing. Flavours of truffle, clove, liquorice, burnt toffee and dried fig with a finish of dried mandarin are all qualities which can be enjoyed with a fine cigar. 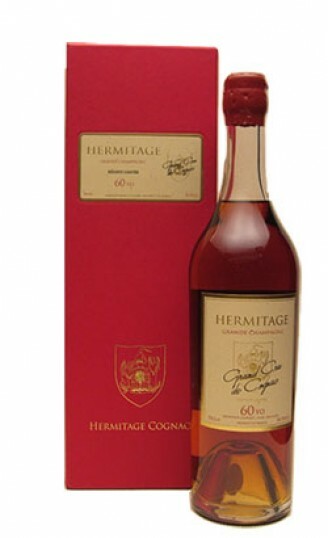 Hermitage Cognac Marie Louise is a 60-year-old Grande Champagne from one of the region's top artisan producers. It is offered in a limited first run of 50 decanters produced by Cumbria Crystal, the last producer of completely hand-blown and hand-cut, full-lead luxury English crystal in the UK. The complex aromas, intensity and depth of flavours created by its careful distillation and ageing have created a masterpiece of smoothness and an intensely rich rancio found only in the rarest of cognacs. This truly great cognac is named after Marie Louise, the second wife of Napoleon Bonaparte. She bore his son who was given the title 'Roi de Rome' and who later became Napoleon II. Aroma: Complex aromas of mocha, dried prunes, roasted chestnuts and masala spice.